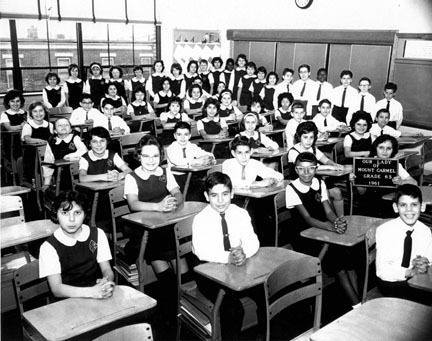 Pictured at left is a sixth grade class at Our Lady of Mount Carmel School, Camden, in 1961. The school building, at Fourth and Spruce streets, is the current home of San Miguel School for students in grades 6-8. Below is the seventh grade class. San Miguel School is hosting graduates of all years from Our Lady of Mount Carmel School for a 100th anniversary cocktail reception on Sunday, May 23, at Tavistock Country Club. Throughout the years, one can see how neighborhoods, culture, values and society as a whole has been subject to change. The same is true for Camden. Specifically, the corner of Fourth and Spruce has seen a few changes over the past 100 years or so. The one constant has been that the large brick structure has always served as an educational center and safe haven for children in South Camden. In 1908 St. Michael School opened its doors to 391 students and two teachers, Sisters Mary Verda and Alice Holland, a candidate, of the School Sisters of Notre Dame. 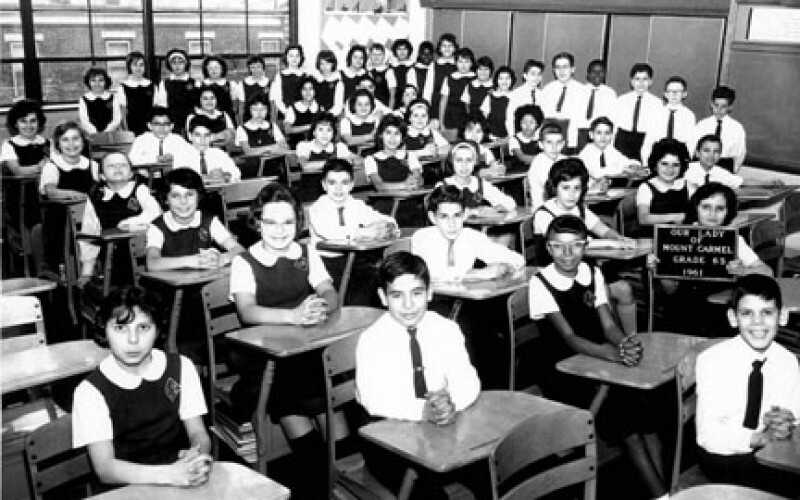 After the parish, Our Lady of Mount Carmel, still in its infancy, and its pastor Father Michael DiIelisi petitioned the Diocese of Camden, the school was established to educate the predominantly and burgeoning immigrant Italian families of South Camden. In 1919 the school’s name changed to Our Lady of Mount Carmel under pastor, Father Brendan Shea. The school had to account for the steady increase in population with renovations and annexes. 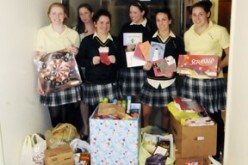 When these efforts weren’t enough to meet the educational demands of the parish, Our Lady of Mount Carmel School held a capital campaign to raise funds for a new school building, which was blessed and opened in the fall of 1953. Enrollment reached as high as 1,000 from kindergarten through eighth grade, including the business/ commercial school. Then came the winds of change. Shifting demographics, declining enrollment of religious vocations, increasing tuition, and changing cultural values all affected the school’s enrollment. After a fire that destroyed the Commercial School building in the 1970s, the decision was made to close the school shortly thereafter. It is estimated that over 5,000 students graduated from OLMC in its nearly 70-year history. Viggiano mentioned the solidarity of the school. “We were all so close because most of the students were related, and if you weren’t related, your parents were friends with other parents,” he said. 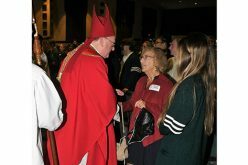 Another OLMC alumni, Joe Teti, Class of 1959, echoed Viggiano’s sentiments. “We all came from the same background and family experiences which made us more like family than classmates,” said Teti. In addition to recalling when he made palms in seventh and eighth grade before Palm Sunday to sell, Teti’s favorite subject in school was U.S. history with Sister Regis. “You knew you went to OLMC when you were happy to go to school every day and everybody knew your name when you got there,” he said. Despite the closure of this storied school, the corner of Fourth and Spruce streets continued to be an educational hub for South Camden. El Centro Day Care established itself there in the 1980s and served the early education needs of the neighborhood kids until it moved to its new facility in 2007. In 1997, the building was once again reinvented as The San Miguel School of Camden led by The Brothers of the Christian Schools. San Miguel emerged due to the changing socioeconomic climate in Camden and the need to offer an alternative to the cost-prohibitive Catholic schools and failing district elementary schools. Its mission is to provide young men with a quality and well-rounded Catholic education regardless of their family’s financial status. Its programs provide the necessary academic, spiritual and social skills needed to be successful learners and responsible citizens. 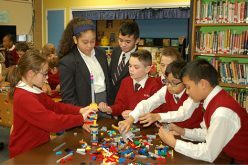 Unlike the populous beginnings of St. Michael School in 1908, San Miguel opened with and has sustained a capacity for 45 students and three grades, 6-8. The true purpose of the school is to provide a human and Christian education to children who are poor. The students attend an extended school day (7:30 a.m-5 p.m.) and an academic year (10 months) to ensure continual reinforcement of curricular and co-curricular programs, including service-learning. No one is turned away because of lack of financial resources. Parents pay $25 per month for their sons to attend. The actual cost to educate one student for an academic year is over $12,000. The school must seek financial assistance from individuals, corporations and foundations in order to sustain its day-to-day operations. As OLMC did 50 years ago to accommodate the needs of the neighborhood, it is the vision of San Miguel to continue to grow in the coming years by adding a fifth grade, a performing arts center, and lower school, establishing co-ed classes, and eventually building a high school. 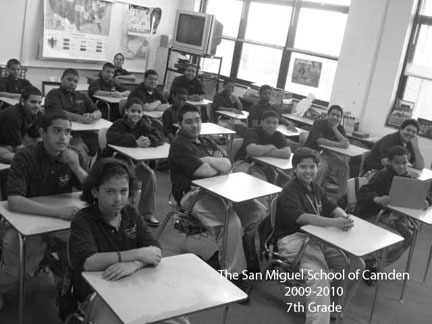 The San Miguel School of Camden is grateful for the rich history of the OLMC school and parish. Their ability to flourish and educate thousands of students over 70 years is a powerful, yet beautiful example of the vital fusion of faith, academics and principles. In celebration of this appreciation, The San Miguel School of Camden is hosting graduates of all years from Our Lady of Mount Carmel School for a 100th anniversary cocktail reception on Sunday, May 23, at Tavistock Country Club. The event will be held from 4-7 p.m. and attire is “Your Sunday Best,” just like Mom would say. The cost is $40 per person. Graduates are encouraged to bring their family and friends, as well as memorabilia to display and share. There will be a raffle and prizes to benefit The San Miguel School of Camden. While the demographics and physical aesthetics of Camden have changed significantly since 1908, the hard work and dedication of those who inhabit that building at the corner of Fouth and Spruce has not. It seems to be the inherent mission of the building that it is used, as G.K. Chesterton observed, to simply pass on the soul of a society — through academics — from one generation to the next.